For Windows 7, 8, & 10 users (particularly 64 bit versions) -- After installing WINKS -- If you are having problem running WINKS do this: To run WINKS (first time only) - right click on the WINKS icon or on WINKS 7 in the Explorere menu. Select Properties. Select Compatibility. Toward the bottom of the screen is a category called Privilege Level. Check Run as Administrator. For then on, simply click the WINKS icon to run the program. For Windows 8 and 10 users -- it may be necessary to enter you activation code in all lower case for it to work. Click the Advanced button on the Shortcut page to get to the Advanced Properties dialog. 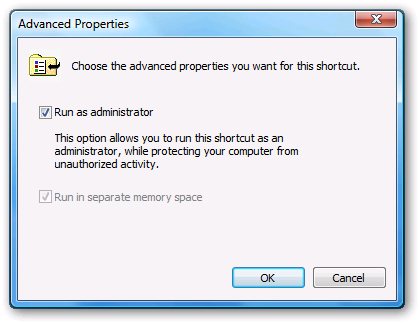 Note the checkbox for 'Run as administrator'. Check this box and choose OK. WINKS will now run normally then you open it using the icon shortcut on your desktop. What are the limits for a particular procedure within WINKS? For a list of current program limits, click here for more information. 2. Open a new Excel sheet (File New), place your cursor in A1 and choose Edit Past Special... From the dialog box, choose Values (it is in the left column of copy choices). This copies the values (not formulas) into the new spreadheet. 4. Go to WINKS, and open the file using the Excel (.xls) file open option. 1. In Excel, choose File, Save As... and save the table as a .CVS file (suing Save files of type). 2. In WINKS, choose Open, and files of type .CVS, and open the file. 1. In Excel, open the spreadsheet and choose Menu, Save As... Other Formats... and select Save as type CVS (Comma separated (.cvs). 3. If there are fomulas in the Excel file, see the information above for that issue. Also see Preparing Excel Data for Import into WINKS. Still having problems? Create a help ticket with TexaSoft by clicking here. This version of WINKS is no longer supported. Here are some older FAQs concerning that version. We recommend that you upgrade by clicking here. File not found -- program fails. This answer refers to error messages when running WINKS such as "File not found" or "End of File". The current version of WINKS requires that all directories and filename referenced be simple -- no blanks and 8 characters maximum. For example, the directory C:\WINKS48 is okay, but if the program is stored in a directory called "C:\Program Files\WINKS" it will not work properly because of the blank in the name and the long directory name. The same is true for data file names. They name mydata.dbf is okay as a filename, but "my research data.dbf" will cause problems. The problem with long file names and directory names will be resolved in the upcoming version WINKS SDA 6.0, which should be available by January, 2007.
for a resolution. This error is caused by missing or damaged file in Windows. If you get an error message when you try to run WINKS such as "Version of THREED.VBX is old or outdated" or something similar (could also be a similar error concerning the file VBRUN300.DLL), it is usually caused by some other program that has loaded an incompatible version of a VBX or DLL into your WINDOWS directory. The WINKS installation does not write ANY files to your \WINDOWS or \WINDOWS\SYSTEM directory, but some unfriendly programs do. To correct this situation, do one of these two items. 1. From the Start menu, select Find, then choose Files or Folders. 2. In the "Named" text box, enter THREED.VBX (or whatever). Make sure the "Look in" box includes your hard drives, or at least drive C:. 3. Click Find Now. The program will find all instances of the file on your hard drive. 5. If fixing the file in C:/WINDOWS/SYSTEM does not solve the problem the one of the other files you found in step 3 is old and is conflicting with the program. You'll have to replace any offending copies of the file with the ones from the WINKS directory. Reboot and try to run the program again. You'll be prompted to save the file, then you will need to unzip it and copy the files vbrun300.dll and vbdb300.dll into your WINKS directory. If you don't know how to unzip files, please see the link to unzipping files on the Texasoft web site at www.texasoft.com. However, try the info above before downloading new copies of these files. How to I create a database using random numbers? This topic is addressed in one of the tutorial topics. Click here to view it. To read a WINKS file into Excel, simply select File/Open in Excel, then from the "Files of Type List" drop down list on the Excel Open dialog box select "dbase files (*.dbf)". Locate the WINKS file to open and it will open directly into Excel. 1. Open Excel, highlight the cells you want to import (including the names of the columns) and then do a "Save as..." and select a dBase file type. 3. Begin WINKS and open the .dbf file you just saved. Usually the file will come in without any problems. To check the file after opening it, click on edit to verify that the names and numbers are good. 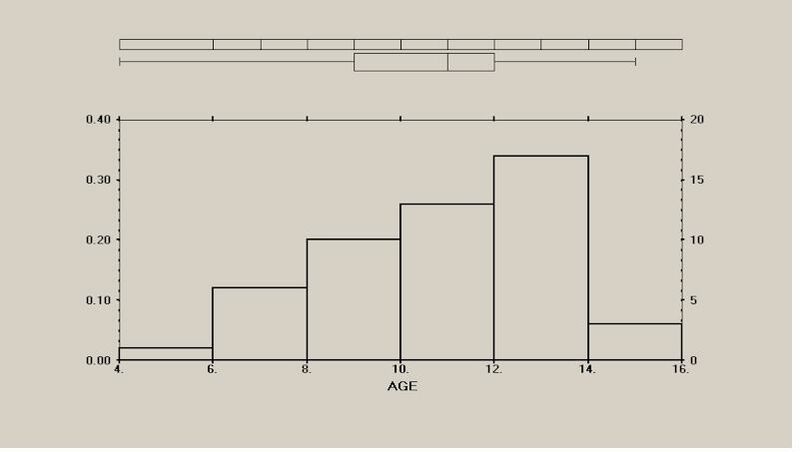 What is the bar at the top of the WINKS histogram graph? The bar that appears above the box and whiskers plot on the histogram is a data location plot. Its purpose is to give you an idea about the distribution of the data points in your data set. On this plot, a line appears at a location where one or more data points fall. For example, if your data are all integers, you would see that the lines on this plot appear at equal intervals. In the displayed histogram from the EXAMPLE.DBF database, you can see that the lines on the plot are equally spaced. This is because ages are measured in integers. Thus, although the histogram and box plots indicate that the data might be "normal," the data location plot gives you additional information that tells you the data are probably measured in integers (or at least in fixed intervals.) -- information you could not see using only the other two plots. If your data values are truly continuous, you would see lines on the plot that appear in an almost random fashion. If the data are also normal, there would be a cluster of lines toward the mean of the data with fewer and fewer lines toward the tails of the plot. In general, the data location plot is another tool to help you understand the distribution of the numbers in your data set. How do you move data that is currently in SAS to a file that can be read by WINKS? SAS for Windows 6.12 has a data export facility that allows you to export SAS data to a dBase (.dbf) file. These instructions show how you can create a dBase (WINKS compatible) file from your SAS data. Step 1: Run SAS and open your SAS data set. Or, using menus you can choose Globals/Access/Display Libraries. Then select "New Library" and "Find Folder." Then find the ".sd2" SAS data file you want to open. RESULT  Youve opened a SAS data set (either temporary or permanent)  now you can export the data set to dBase. STEP 2: From the SAS File menu, select EXPORT. If youre accessing a permanent data set, select the library name you defined above in the Library pull-down menu. If youre using a temporary SAS dataset, select "WORK" as the Library name. STEP 5: Indicate the name of the export file by clicking BROWSE, finding the directory where you want to put the file, and then enter the filename. CLICK Save. Then click Finish. Your dBASE file should now be in the location you indicated. You should now be able to use the file in WINKS. Run WINKS and open the new file. Review the file in the WINKS editor to make sure all the data was properly exported before performing any analysis. Saving and reloading First Impression Graphs. When you create a graph using the First Impression module, it allows you to save a file in a .vtc format (right click, save). In general WINKS does not support the .vtc file format, but you can retrieve a saved chart into First Impression by displaying any chart using First Impression, then right click on the chart and select load... open the .vtc file and the saved graph will display. Problem with F-Statistic in p-value module.